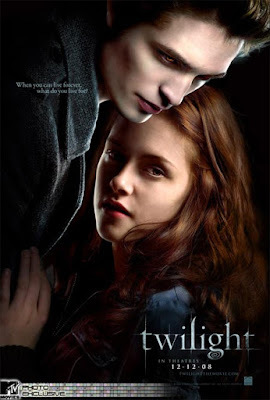 The Double Featurette: "Bright Star" and "Twilight"
No I wasn't kidding. Yes I said Twilight. (and its not just because the above posters are so similar) Now, I am not saying that Twilight comes ANYWHERE CLOSE to Bright Star, which was restrained, minimalist, beautiful. Buuuuut... when I saw Twilight, it struck me as not merely a film for 13 year olds but a indie movie watching 101 training for 13 year olds. When was the last time that you saw a tween film move so slowly, focusing on scenery and mood, long takes of the characters as they lay in the grass gazing into each other eyes? Voiceover.... Its like Terrence Malick with training wheels... Maybe when these 13 year olds hit sixteen they will be so used to this slow pace they will not fall asleep in films like Bright Star but will savor the beauty. It was a welcome change from quick fire speed of most tween fare these days. There is a scene in Bright Star in which John Keats, played by the up and coming Ben Whishaw, describes poetry as something which should not be dissected: You do not jump in the lake of poetry to just immediately get to the other side. You let yourself stew in the waters/ experience, take it in. That is how I feel about Terrence Malick and was definitely a mantra that Jane Campion was channeling in Bright Star. Instead of a story, you get almost a series of vignets, flashes of a mood. In Brief: Coco Before Chanel & My Brilliant Career - Strong independent feminine women (the characters and the actresses). The opening sequence in which the young Coco is being taken with her sister to the orphanage in a cart is one of the best openings I have seen in a while. The point of view shots we get from between the slats of wood on the cart are reminiscent of the framing being adjusted on a projector...beautiful. Jane Campion is truly one of the most influential female voices in film today, and I don't think anyone else could have captured the essence of Keats' story like her!